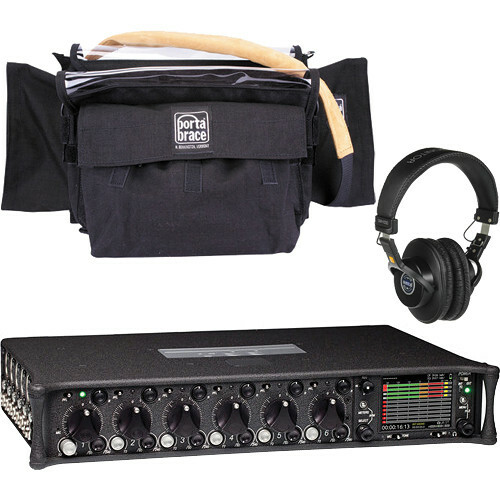 The Sound Devices 664 Six-Channel Portable Production Mixer and Porta Brace Case Kit from B&H prepares you for the professional field recording world. This exceptional quality mixer/recorder and the Porta Brace padded case, which features cable management and vinyl windows, will get the job done for you day after day. The case also features allocated space for the Sound Devices CL-6 Input Expander. The 664 Six-Channel Portable Production Mixer with Integrated Recorder from Sound Devices has an unprecedented amount of functionality from a unit that can be battery operated. It starts with a low-noise, transformerless preamplifier section, continues to an intuitive mixing surface, adds a host of digitally-controlled routing features, allows room for analog inserts and aux busses, and finally terminates with versatile, plentiful output connectivity. By the way, the 664 can be configured to record digital audio to CompactFlash or an SD Card from any point in that signal flow. The Sound Devices 664 has an input board that features six balanced XLR connections. Within the firmware, they can be selected to accept microphone or line level signals. Additionally, inputs 1 and 6 can configured to accept AES digital signals. Each channel has a direct output on an independent TA3 connector. There is also an input for a slate microphone, if you don't wish to use the 664's internal slate mic. Two headphone outputs are also provided. The black Mixer Combination Case from Porta Brace is a well-padded, well-protected case for your Sound Devices 664/CL-6 mixer. This case comes with a removable RM-Multi Wireless Mic Case for added flexibility while in the field. The MXC-664 is made of 1000D Cordura nylon and comes with a touch fastened front flap for rapid access to the contents. It also features vinyl windows for easy reading of dials and switches. The suede shoulder strap enables you to carry the case either over your shoulder or around your neck. At only 1.0 lb, this case won't add much weight to your gear load but will make your work more efficient. The case is made in the USA and backed by a one-year limited warranty from Porta Brace. The kit also includes the Senal SMH-1000 closed-back professional monitor headphones. Note: Please note that not all memory cards are approved to work with this device. Please check manufacturer's website for a list of approved cards. The physical mixing surface of the 664 has the basic features you'd expect, such as trim pots, panning and level knobs. But it also has more advanced features, like sweepable high-pass filters and pre-fader listen switches on each channel. The 664 has very flexible routing options within its LCD-based menu. When a channel's pre-fader listen switch is pushed to the right, it brings up that channel's menu options. Input level, pre/post track routing, aux buss routing, mix routing and polarity can all be adjusted. Channels can be paired in left/ride or mid/side modes. Phantom power can also be engaged at either 48V or 12V. The Sound Devices 664 has many output options, from its balanced XLR main outputs to the unbalanced 1/8" stereo tape output. It can even send and receive word clock and timecode signals. Two Aux outputs on TA3 connectors allow custom track groups to be routed to external devices. The outputs can even be set to send AES digital signals of each buss and channel. The 664 has an integrated recording system that tracks WAV files at up to 24-bit/48.048kHz resolution to CompactFlash or SD cards. The whole device can be powered by five AA batteries or an optional DC adapter. The MXC-664 is made of 1000D Cordura nylon and comes with a touch fastened front flap for rapid access to the contents. It also features vinyl windows for easy reading of dials and switches. The suede shoulder strap enables you to carry the case either over your shoulder or around your neck. At only 1.0 lb, this case won't add much weight to your gear load but will make your work more efficient. The case is made in the USA and backed by a one-year limited warranty from Porta Brace. The SMH-1000 Professional Field and Studio Monitor Headphones from Senal feature a classic closed-back, over-the-ear, collapsible design. With features like interchangeable cables, a refined frequency response, wire guides, superior comfort, and durable materials, the SMH-1000 is ideal for studio and field applications. Equipped with 40mm neodymium drivers at 58-Ohm impedance, the SMH-1000 headphones are designed to be loud enough when attached to low powered devices such as mobile phones and mp3 players, yet robust enough to handle studio headphone amps without distortion.The over-ear, closed-back design is intended to help block unwanted outside noise, which is useful in professional field recording and studio monitoring scenarios where isolation is critical. The headphones are designed with an EQ curve that's been tailored for a slightly enhanced low end that allows field engineers to detect wind noise more effectively, and for studio engineers to monitor bass and sub bass frequencies. The high frequency response has been extended to accurately reproduce spatial detail. There is also a pronounced but smooth midrange that reduces ear fatigue over prolonged periods, while maintaining focus on vocal and dialogue intelligibility. Designed for flexibility as well as great sound, the SMH-1000 makes use of twist-lock detachable cabling. There are two detachable cables included in each box that can be used interchangeably. There is a stretchable 4 to 10' coiled cable that provides better mobility and reach, that also helps prevent snags from pulling the headphones off of your head. This can be useful when navigating through gear-cluttered recording studio environments. There is also a 3' straight cable that is useful when less slack is ideal, such as when using a waist-mounted field recorder or mixer, or when using your mobile device. The SMH-1000 has been built with convenience, practicality and comfort in mind as well. The headphones have a collapsible folding mechanism for compact storage and transport. They also have wire guides to keep the ear-cup wires from pinching. Furthermore, they are fitted with a padded headband and soft, replaceable ear cushions to maximize comfort during extended listening. An excellent choice for commercial recording, broadcast, home studios, and live and location sound. Also great for home and portable entertainment. Over-ear, closed-back (circumaural) stereo headphone design to help block unwanted environmental noise. Ideal for use in professional applications such as studio or field recording. Detachable, twist-locking 10' coiled cable and 3' straight cable included. Replacement cables also available from Senal. Enhanced low end designed to allow field engineers to detect wind noise effectively, and for studio engineers to monitor bass and sub bass frequencies. Pronounced but smooth midrange tailored to reduce ear fatigue over prolonged periods while maintaining focus on vocal and dialog intelligibility. Extended high frequency response designed to reproduce spatial detail accurately. Gradual roll off at 14 kHz allows for accurate low level monitoring and hearing protection. Padded headband and soft, replaceable ear cushions. Replacement cushions are available for purchase. Easy storage via collapsible folding mechanism. Box Dimensions (LxWxH) 16.2 x 11.0 x 5.3"
Box Dimensions (LxWxH) 16.1 x 9.5 x 6.5"
Box Dimensions (LxWxH) 9.1 x 8.8 x 3.8"